In transcription, the strand of DNA that is used to synthesize mRNA is known as the template strand. Whereas, the non-template or coding strand matches the sequence of the RNA. However, it doesn’t match it exactly as RNA has uracil (U) instead of thymine (T). The nucleotides of RNA are known as ribonucleotides. These nucleotides bond to the template strand via hydrogen bonds after the DNA molecule opens up. And then those nucleotides are bonded together with a phosphodiester bond just like DNA is bonded. RNA is an enzyme that synthesizes RNA from the template strand of DNA. And it happens a lot like DNA polymerase, except for the the fact that it does not require a primer before transcription begins Bacteria have a single RNA polymerase, whereas Eukaryotes have three different enzymes. Transcription is initiated by the attachment of a protein known as a sigma. The sigma attaches to one strand of the DNA (the template strand) at a very specific location. In bacteria, several sigmas exists and each one initiates the transcription of a specific sequence of DNA (or gene). Once this sigma protein attaches to the DNA molecule, it serves to guide the RNA polymerase down the template strand. The sigma protein recognizes and binds to what is deemed the promoter sequence. The promoter sequence is a specific group of base pairs. 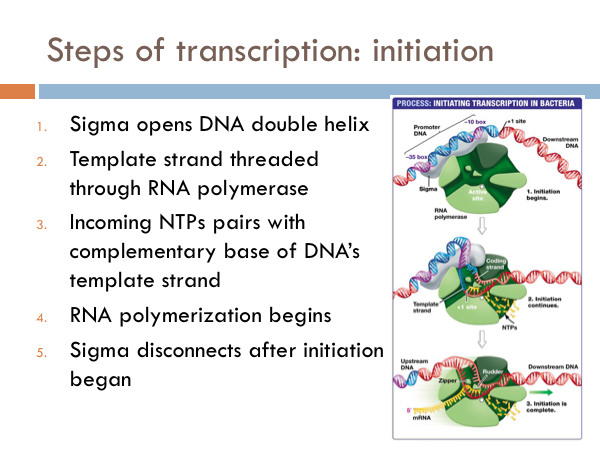 Once the sigma binds to the DNA, transcription begins. There are several different sigmas. Each one is unique and initiates the synthesis of a specific gene, or in some cases several different genes. While there are several sigmas, each for different gene complexes, RNA Polymerase is the same molecule that connects to all the different sigmas. RNA Polymerase adds ribonucleotides to the template strand based on complementary base pairing, generating an mRNA. Elongation in transcription is fairly straight forward. The RNA polymerase zips along the open DNA molecule matching up complementary RNA base pairs from the template strand of the open DNA. After the sigma is removed, RNA Polymerase continues to unzip template and coding strands of the the DNA, and R-nucleotides are bonded via phosphodiester linkages using the code provided by the template strand of DNA. The incoming DNA enters into an intake portal and is unzipped by a zipper. As the DNA passes the zipper, the hydrogen bonds reattach between the coding and template strand and the DNA double helix leaves through an exit portal. Ribonucleotides enter in through another intake portal and are combined via complementary base pairing to the template strand of DNA. The R-nucleotides are bonded together via phosphodiester linkages. Ribonucleotides are continuously added to the 3’ end of the developing RNA strand. The 5’ end of the RNA strand leaves through another exit portal of the RNA Polymerase. While transcription is the process of creating mRNA from DNA, translation is the process of converting the genetic information of mRNA into proteins. In bacteria, translation and transcription happen simultaneously. Ribosomes in proteins are floating right next to DNA. So in bacteria, the ribosomes begin the process of translation before the RNA polymerase terminates the transcription process. Another difference in bacteria is that many ribosomes are working simultaneously to synthesize proteins. In eukaryotic translation, transcription and translation are separated. mRNA are synthesized in the nucleus during transcription. The mRNA leaves the nucleus through the nuclear pore and travels to a ribosome in the cytoplasm, where the process of translation occurs. Most ribosomes are attached to the rough endoplasmic reticulum. However there are several ribosomes within the cytoplasm itself, as well. In addition to mRNA, another important RNA molecule is the transfer RNA, known as tRNA, tRNA is the molecule that bridges the genetic code with the a specific protein. Each transfer molecule is attached to a specific amino acid. And each amino acid has three base pairs attached to the opposite end of it.vAt the ribosome, the three base pairs of the tRNA join up with the complement of the three base pairs of the mRNA. So the three complimentary base pairs of the transfer RNA are known as an anticodon; whereas the triplet code of the messenger RNA is known as a codon. Each anticodon of tRNA links with a specific amino acid is combined to it complementary codon of mRNA at the ribosome. And then the amino acids are linked together by peptide bonds into a growing peptide chain. Let’s take a closer look at the process translation. Translation is initiated by binding to a small subunit of the ribosome. The mRNA has a special section of it right before the start codon that the ribosome recognizes, known as the ribosome binding site. Translation begins with the start codon on the mRNA. 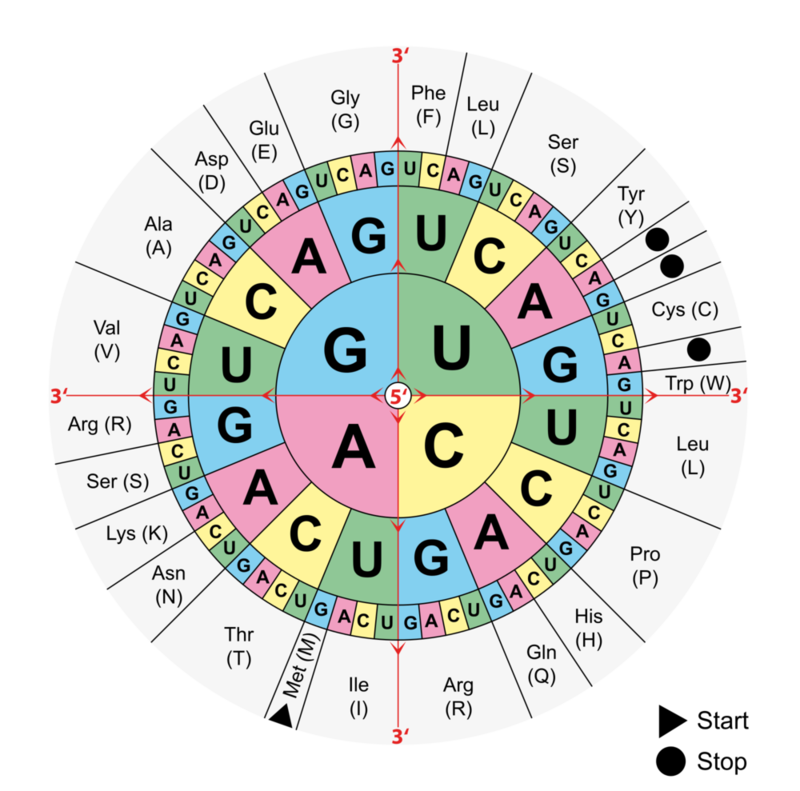 Connected to the tRNA of the start codon is an amino acid, called f-Met. Once the f-Met tRNA binds to the small subunit of the ribosome, the large subunit of ribosome binds to the small unit, and translation is ready to begin. Once the large subunit of the ribosome binds to the small subunit, the elongation process of translation begins. The first anticodon tRNA attached to an amino acid attaches to its complementary codon in the A site of the large subunit of the ribosome.